There is no shortage of inexpensive 15.6-inch allrounder notebooks. Every manufacturer has at least a few models for around 450 to 600 Euro (~$560 to ~$750) in their portfolio. 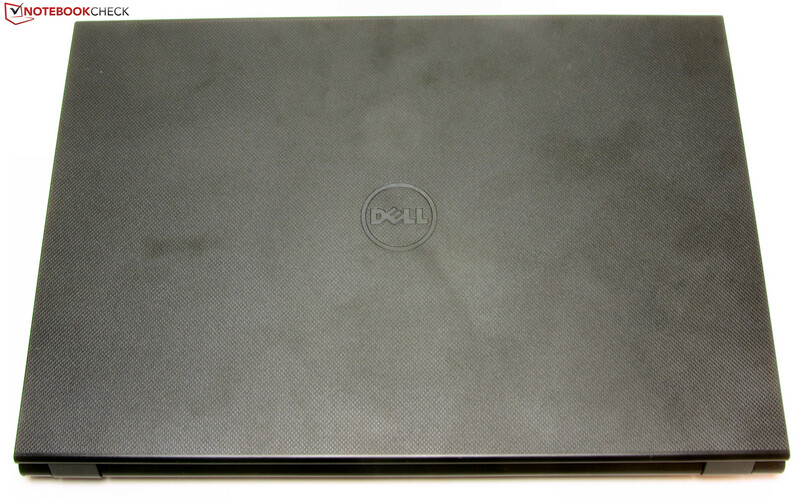 Dell adds their Inspiron 15 3542-2293 to the mix. 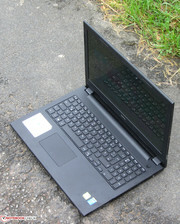 For about 530 Euro (~$660), the notebook comes equipped with a Core i5 CPU, a GeForce 820M GPU, and a 500 GB hard drive. How the notebook handles our tests and how it compares to the competition is the subject of our review. This segment of the market is hotly contested and includes notebooks like the Lenovo IdeaPad Z50-75 (AMD A8-7100, Radeon R6 M255DX) and the Acer Aspire E1-572G (Core i5-4200U, Radeon HD 8750M). Both notebooks are less expensive than the Dell and can be purchased for 430 Euro (~$540) and 480 Euro (~$600), respectively. Other examples are the HP Pavilion 15-p008ng (Core i5-4210U, GeForce 840M) and the Asus X555LN-XO112H (Core i5-4210U, GeForce 840M), which sell for around 600 Euro (~$750) each. The Inspiron sports a simple black plastic chassis. Most of material is matte, although the left and right sides of the base unit and the edges of the display lid are glossy instead. The back of the display is textured. We like the fact that the notebook has a maintenance cover, which makes accessing the hard drive and the RAM much easier. Unfortunately, fewer and fewer notebooks are equipped with one. 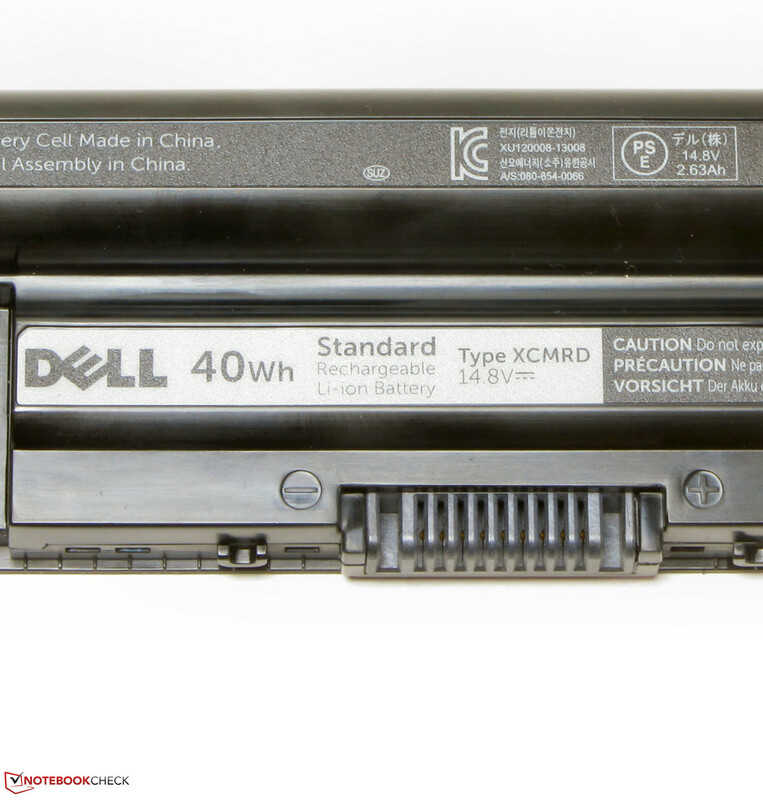 The Inspiron's battery is removable. We can't find many faults with the overall sturdiness or the build quality. 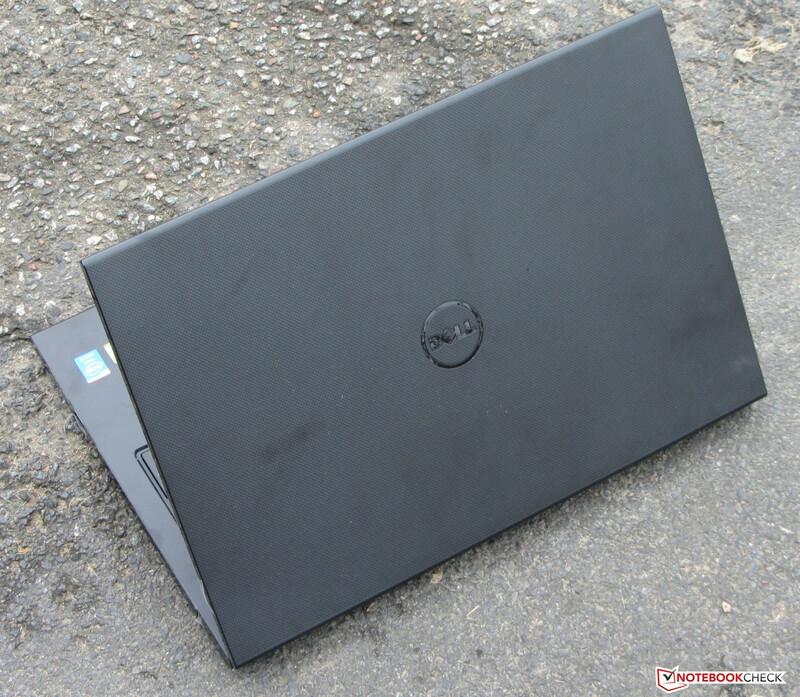 The Inspiron is solid throughout, although it shares a few of the common weak points with other notebooks: the chassis flexes to the left of the keyboard, and neither the base unit nor the display lid are torsionally very rigid. When we twisted the display, the lid protested with slight creaking sounds and the picture changed slightly. Pushing down on the lid from behind impacts the picture as well. The hinges hold the display securely, although we observed some bouncing. We were able to open the display lid with one hand, as long as we jiggled it a little to aid the process. The back of the display lid is textured. 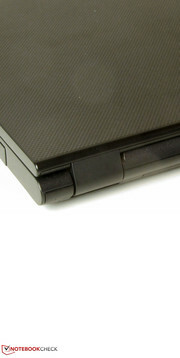 The Inspiron is equipped with the common selection of physical ports. Both the Ideapad Z50-75 and the Aspire E1-572G are similar in that respect, although both feature VGA out as well and Gigabit Ethernet. The Inspiron has Fast Ethernet only. 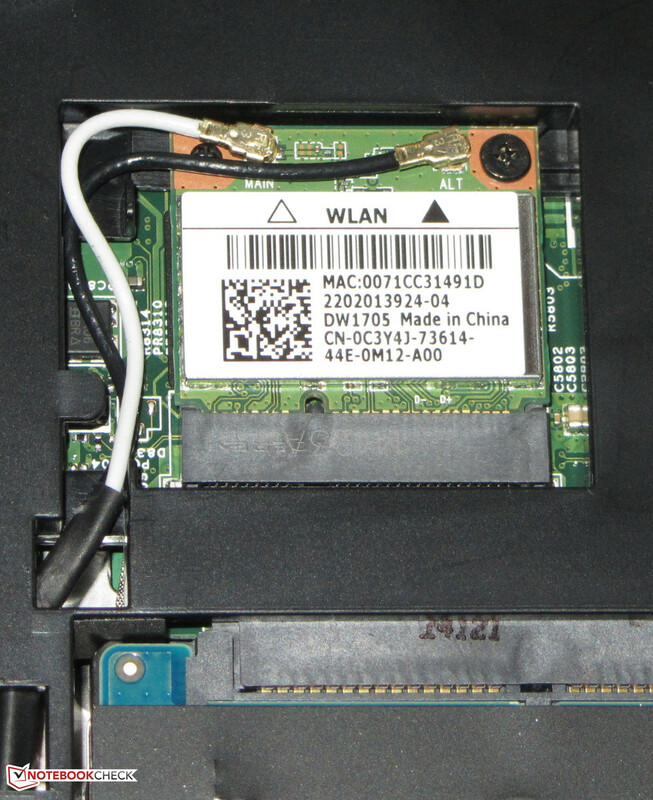 Our review model is equipped with a WLAN module from Atheros, which supports standards 802.11 b/g/n. We didn't run into any reception problems and had a stable connections up to 15 meters around our wireless router. In our opinion, Dell should update the Fast Ethernet connection to a Gigabit Ethernet instead. Bluetooth 4.0 is on board as well. The integrated webcam, which supports up to 1280 x 720 pixels, is nothing to get too excited about, as pictures generally appears washed out. Included in the box are a quickstart guide and a security pamphlet. 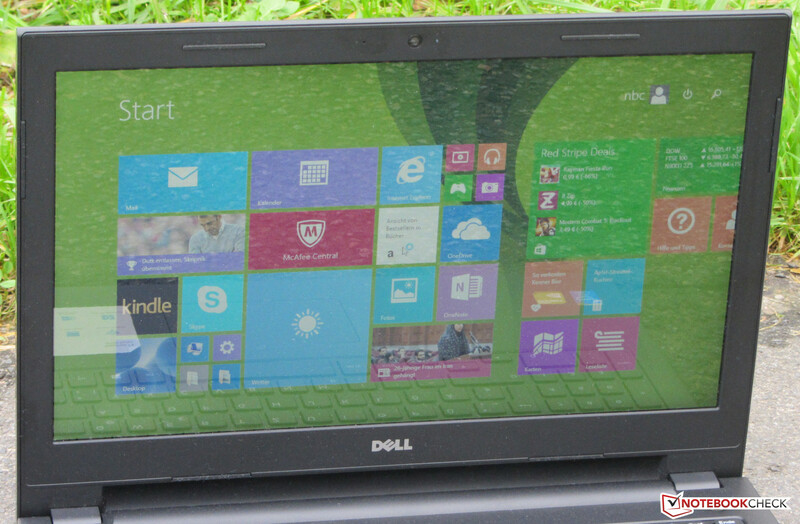 The Inspiron ships with Windows 8.1 (64 Bit) preinstalled. A recovery DVD is not included. 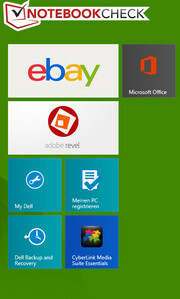 Users who prefer Windows 7 can set up that OS as well since the drivers are included. 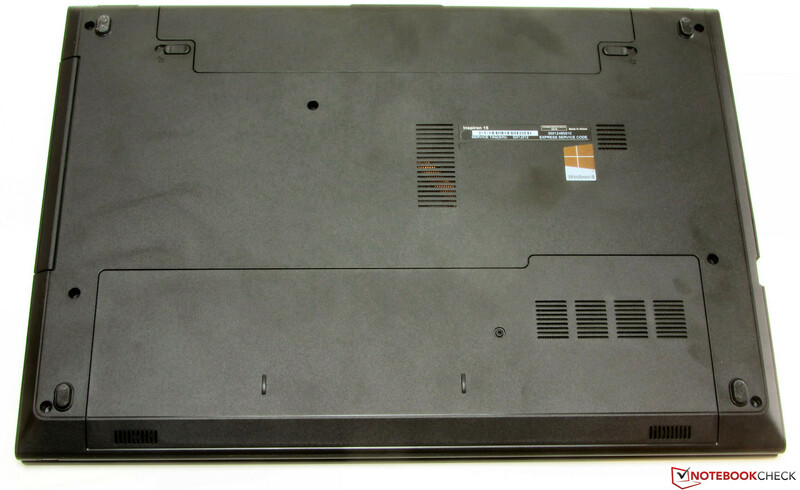 The Inspiron comes with a maintenance cover which is held by a single screw. 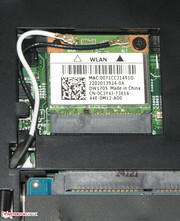 Removing the cover reveals the hard drive, the WLAN module, and the system RAM. 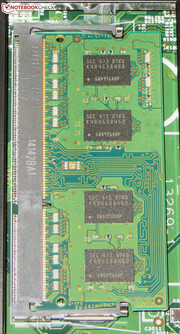 The notebook only has a single RAM slot, which of course is occupied. Swapping the hard drive out for a different one should be fairly simple. 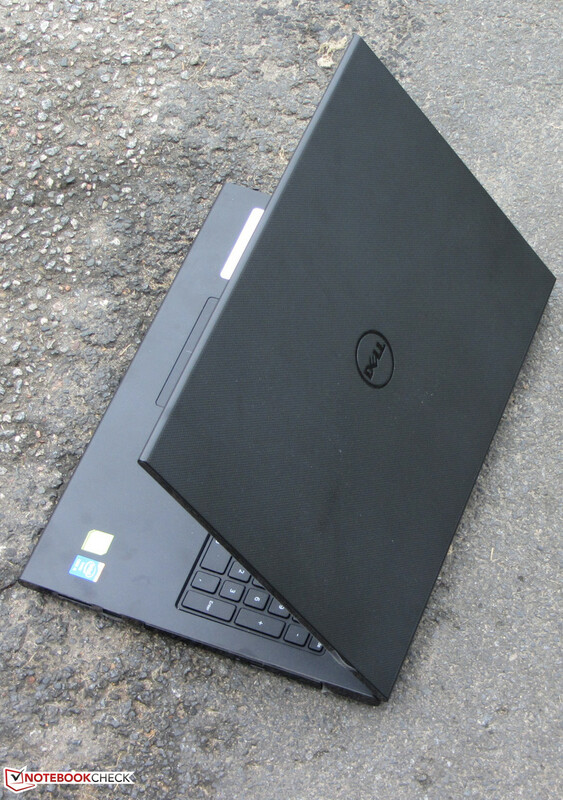 Users who buy the notebook directly from Dell Germany have their notebook protected against defects for 12 months. If the Inspiron is purchased from a dealer, the coverage period is a longer 24 months. Warranty extensions are available for both scenarios. Extending the warranty to 3 years in-home costs about 140 Euro (~$175). 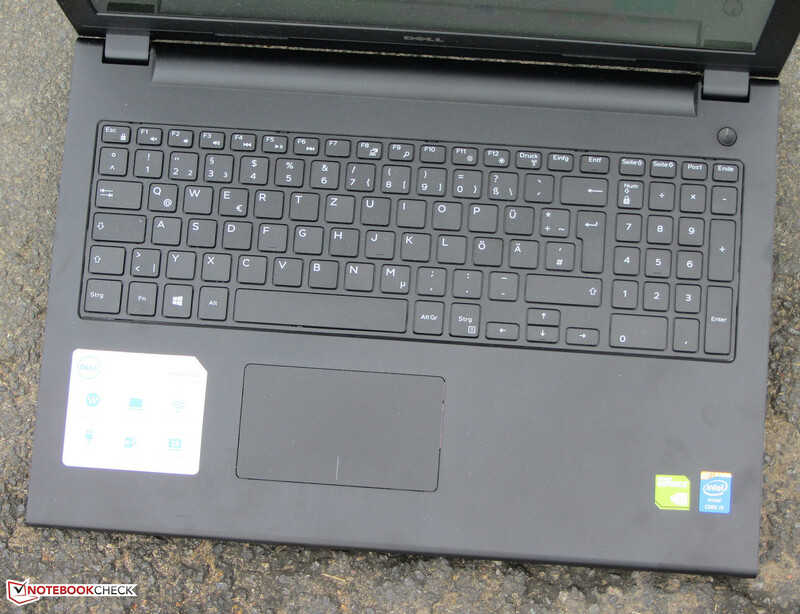 The Inspiron comes with a chiclet-style keyboard which is not backlit. Something we didn't appreciate is the fact that the lettering of the special function keys (like volume control) is not a different color. We wouldn't have expected more from Dell as far as ergonomics are concerned. The flat, slightly rough keys feature short travel and a clear feedback, although the resistance could be a little higher still. When typing, the keyboard only flexes a little on the right side, although it's minor enough to not be bothersome. 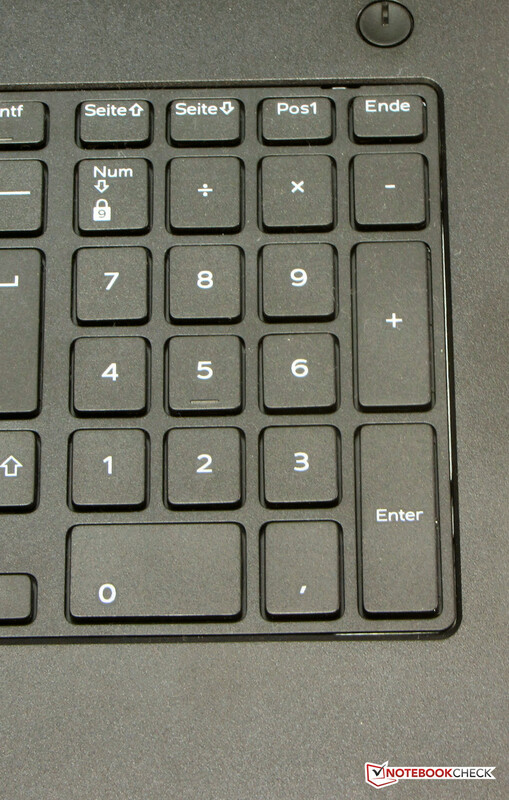 The Enter key is a bit on the small side, which can lead to accidental misses. 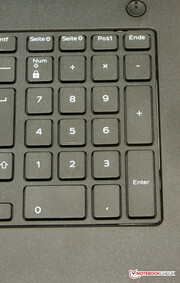 The multitouch-capable clickpad measures 10.5 cm x 6 cm. 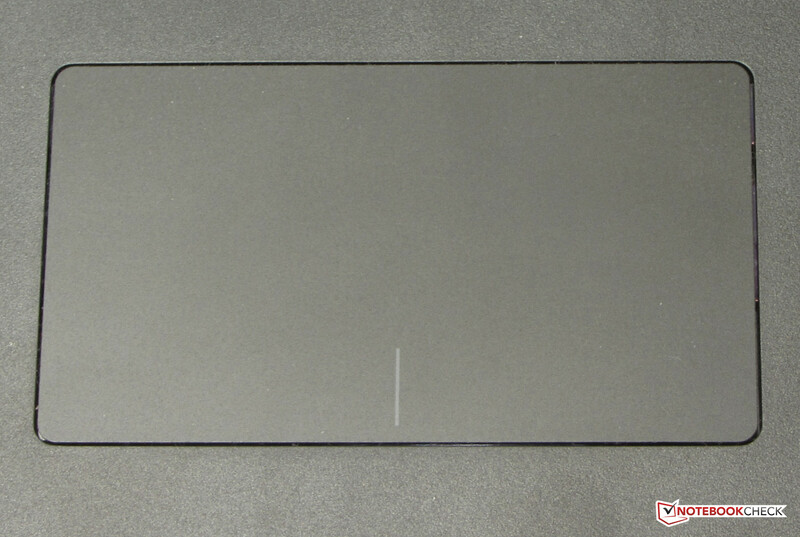 In our opinion, there's enough room for an even larger touchpad. The surface is slightly rough to the touch and allows the fingers to glide effortlessly. Gestures were easy to control and the configuration menu allows them to be turned on and off as desired. Click travel is short with clear and audible feedback. 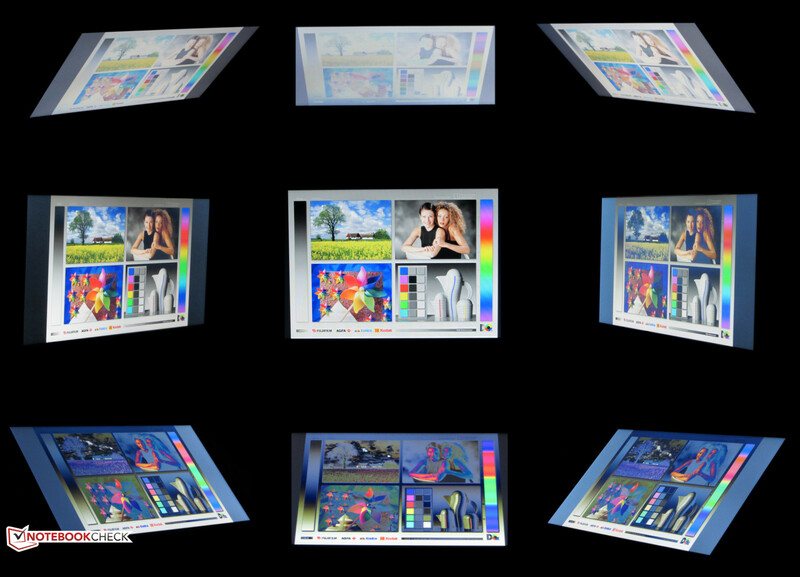 The 15.6-inch glossy display has a native resolution of 1366 x 768 pixels. The brightness of 211 cd/m² is no cause for celebration, but given the price of the notebook, pretty much expected. The screen of the Ideapad Z50-75 features a similar brightness (223.9 cd/m²), while the Aspire E1-572G is much dimmer (182.3 cd/m²). The positive outlier is the Pavilion 15-p008ng (329.4 cd/m²), which also comes with a Full-HD display. Things look up as far as contrast ratio (691:1) and black value (0.33 cd/m²) are concerned. 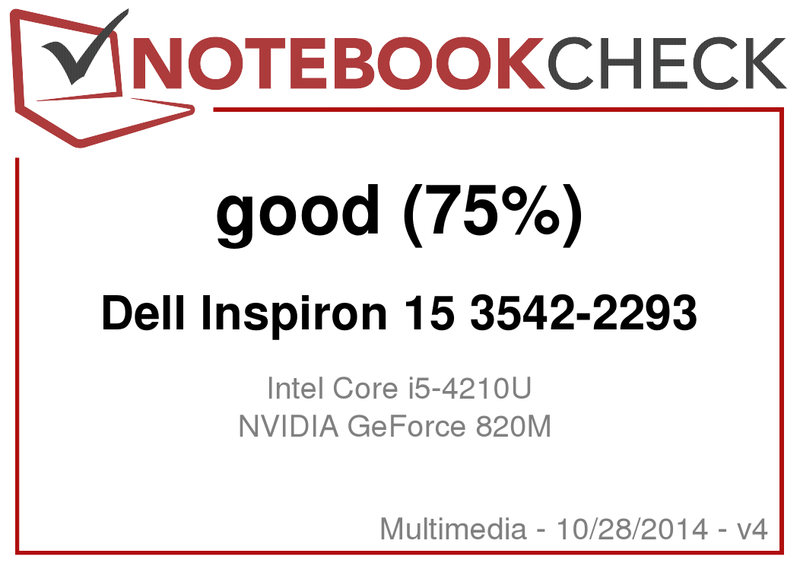 Here, the Inspiron outperforms the Ideapad Z50-75 (536:1, 0.42 cd/m²), the Aspire E1-572G (415:1, 0.47 cd/m²), as well as the Pavilion 15-p008ng (336:1, 1.02 cd/m²). 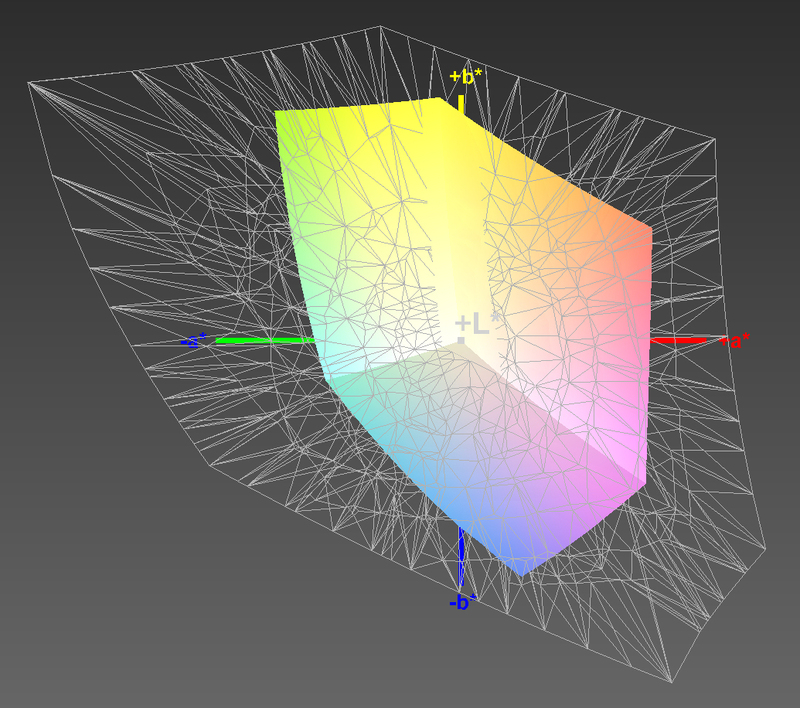 The panel can't reproduce the professional color spaces AdobeRGB at 37 % and sRGB at 53 %. Color reproduction also is appropriate for the price range of the notebook. The average DeltaE deviation of 9.6 is comparable to what most displays in this category are capable of. A deviation of less than 3 would be ideal. We also noticed a distinct bluish cast. Because of the reflective display, outdoor use is only possible if the environment isn't too bright. Given the price point, it is clear that Dell could not incorporate an IPS display. The TN panel has low viewing angle stability and the picture quality deteriorates quickly in the vertical axis. 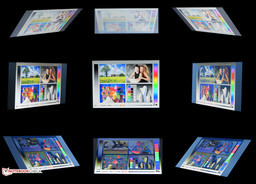 In the horizontal plane, the display is more forgiving and several people can view the display at the same time. 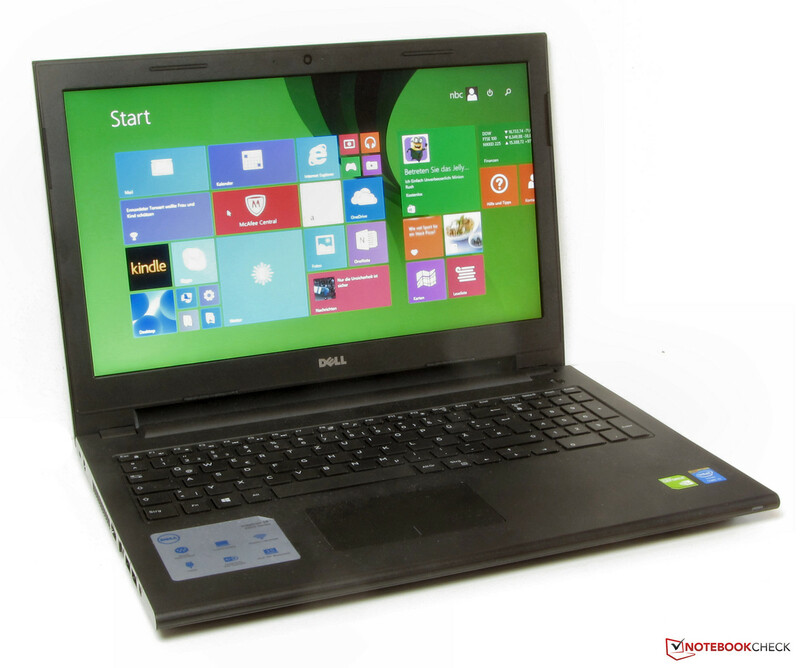 The Inspiron 15 3542-2293 is an inexpensive 15.6-inch allrounder notebook. The GeForce graphics card should make it possible to at least occasionally play games. Our review notebook sells for about 530 Euro (~$660), although many other configurations are available, including versions with and without dedicated GPU and with or without touchscreen. 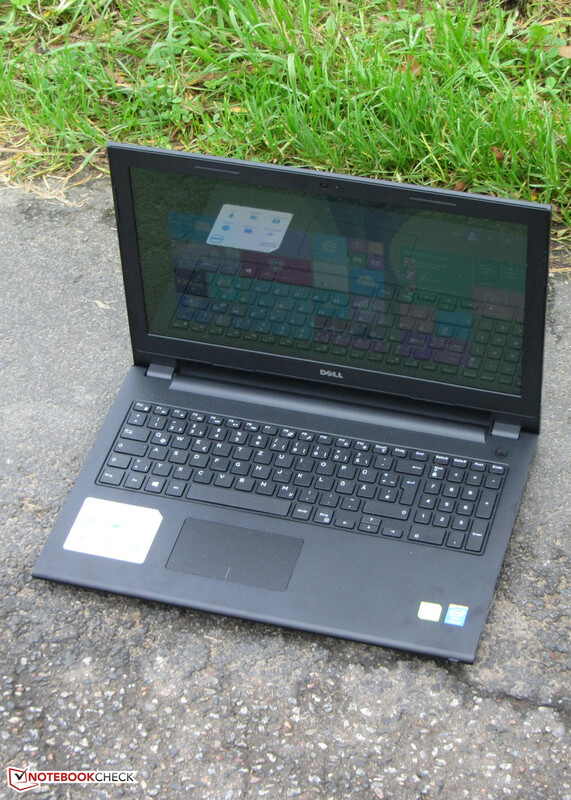 The Inspiron relies on a Haswell-generation dual-core Core i5-4210U CPU. The processor has a clock speed of 1.7 GHZ and can overclock to 2.4 GHz (both cores) or 2.7 GHz (one core) using Turbo Boost. The CPU is exactly 100 MHz faster than the Core i5-4200U, which is not really noticeable during daily use. 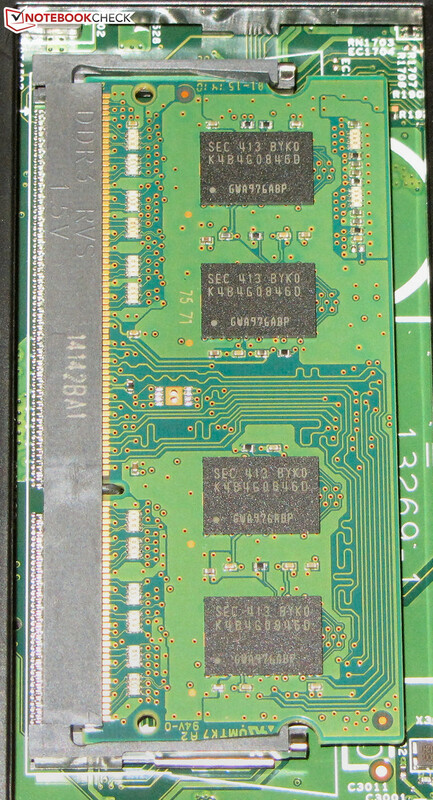 The Core i5-4210U is a ULV CPU with a very modest power consumption. 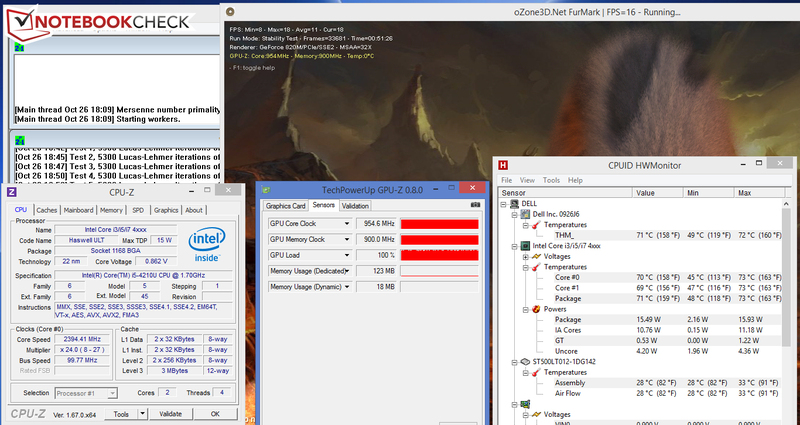 The CPU tackled the Cinebench benchmark tests at the maximum 2.4 GHz regardless if the notebook was plugged in or running on battery. During the single-threaded tests, on or the other core jumps to 2.7 GHz at regular intervals. The Turbo levels are fully utilized at all times. We didn't run into any problems during our time with the review notebook, as it ran smoothly and reliably. The results of the PCMark benchmark tests are good as well. 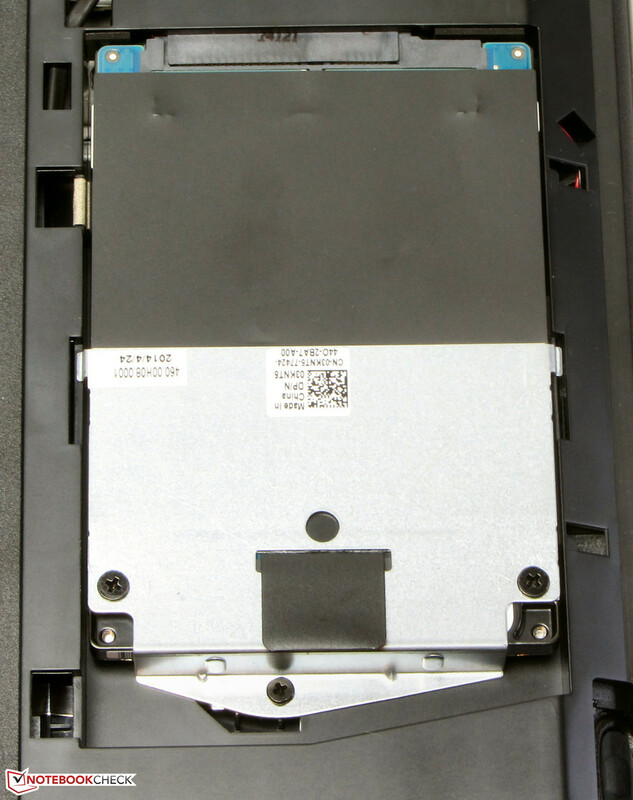 Users who require better performance might want to swap out the hard drive for a Solid State Disk, which should be easy to accomplish thanks to the cover on the bottom. Both application starts and system boots would then improve noticeably. The hard drive is a Seagate Momentus Thin model with a capacity of 500 GB and a rotational speed of 5400 RPM. CrystalDiskMark attests the drive a read speed of 100.3 MB/s, while HD Tune reports an average transfer rate of 84.1 MB/s. Both recorded values are in line with what we expect from a 5400 RPM hard drive. Nvidia's Optimus technology is responsible for the graphics output. 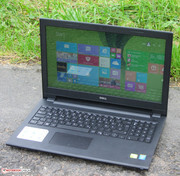 The Intel HD Graphics 4400 GPU handles less power-intensive tasks and sees duty when the notebook is running on battery. Nvidias GeForce 820M GPU takes over demanding graphics applications like games. The switch between the graphics cards is automatic, although the user can intervene if so desired. Both GPUs support at least DirectX 11. The GeForce 820M is an entry-level GPU which operates at a base clock speed of 775 Mhz and a Turbo speed of up to 955 MHz. The results of the PCMark benchmark tests are comparable to other notebooks equipped with the same GPU. Gaming performance should suffice for occasional game playing. Most games can be played without any stutters at the native resolution at low to medium quality settings. Current games like Ryse: Son of Rome or The Evil Within, on the other hand, have high demands on the hardware and the frame rates never reach playable levels. An alternative to the Inspiron is the Acer Aspire E1-572G (Core i5-4200U, Radeon HD 8750M), which not only allows for higher frame rates, but also happens to be 50 Euro (~$65) less expensive. The HP Pavilion 15-p008ng (Core i5-4210U, GeForce 840M) and the Asus X555LN-XO112H (Core i5-4210U, GeForce 840M), which sell for for around 600 Euro (~$750), offer even better performance than the other two notebooks. The Pavilion is particularly interesting because of its Full-HD display. The Inspiron is more or less inaudible during idle. The fan frequently doesn't run at all and the hard drive is the only source of noise. 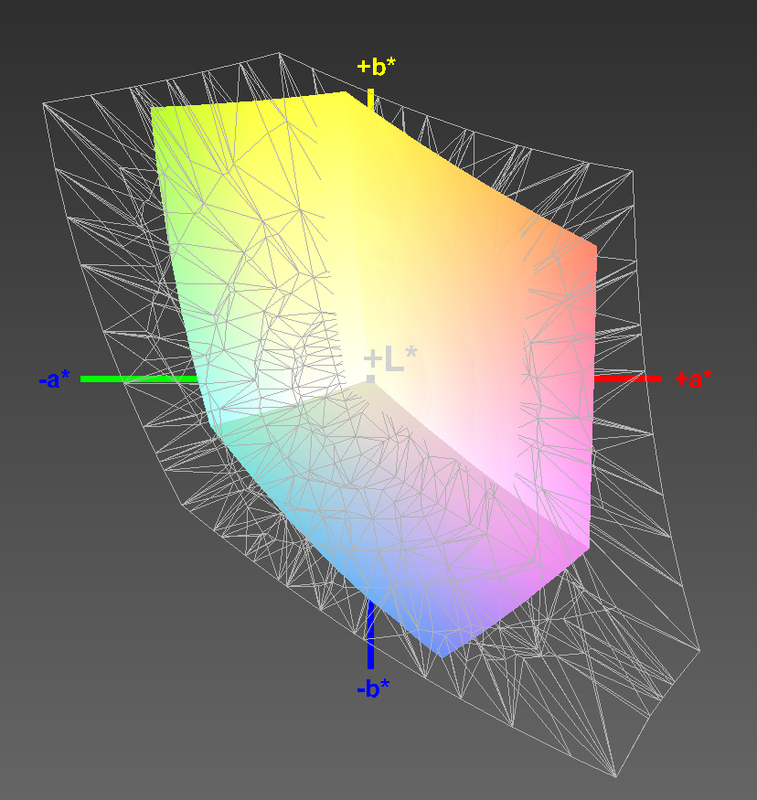 When demands increase, things change and we measured up to 40.6 dB under medium load (3D Mark 06 is running). Full load (stress test, Prime95 and Furmark are running) results in values between 40.4 and 46 dB. Given the performance, these numbers are a little on the high side, as the Inspiron is about as loud as the more powerful HP Pavilion 15-p008ng and Asus X555LN-XO112H. No matter if plugged in or running on battery power: during our stress test (Prime95 and Furmark in parallel for at least one hour) the CPU of the Inspiron ran between 2.2 and 2.3 GHz. The GPU maintained its maximum Turbo speed of 955 MHz. Even though both the processor and the graphics card are running close to their respective maximums during the stress test, the notebook only gets moderately warm. No point of the chassis exceeded 40 degrees C at any time. The very active fan system has a positive impact here. The Inspiron gets about as warm as the HP Pavilion 15-p008ng and the Asus X555LN-XO112H; the Aspire E1-572G heats up more. The stereo speakers are housed on the bottom towards the front edge. While far from outstanding, the speakers get quite loud, although the sound is slightly tinny and the bass is lacking. The latter trait the Inspiron shares with most other notebooks out there. 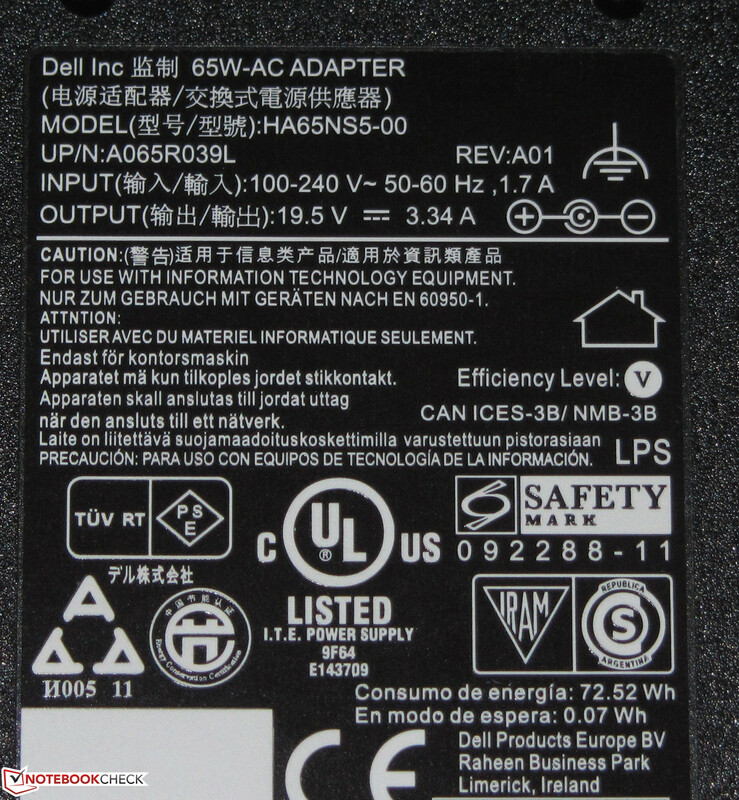 Kudos to Dell as far as the low power consumption during idle is concerned, as we recorded values of under 5 watts. Under medium load (3D Mark 06) and full load levels (stress test, Prime95 and Furmark), the Inspiron requires between 40 and 47.7 watts, which can be considered normal given the hardware. The competitors Aspire E1-572G, HP Pavilion 15-p008ng and Asus X555LN-XO112H are a little less frugal under full load. In idle mode, the Inspiron shut down after 13 hours and 53 minutes. The Aspire E1-572G (9 hours 2 minutes) and the Pavilion (8 hours 41 minutes) don't last nearly as long. For this test, we use the Battery Eater Reader's Test. 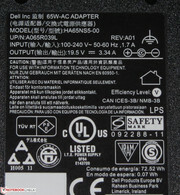 The display is turned down to the lowest level, the power saver profile is active, and wireless modules are turned off. Under load, the Inspiron needed to be connected to an external powre source after 1 hour and 41 minutes. The Pavilion (1 hour 40 minutes) performed quite similar, the Aspire (1 hour 20 minutes) fell behind. For the load scenario, we run the Battery Eater Classic Test with the display set to maximum brightness, enable the maximum performance profile, and activate all wireless modules. During the WLAN test, Dell's notebook shut down after 6 hours and 11 minutes, which is better than either the Pavilion (4 hours 45 minutes) or the Aspire (4 hours 26 minutes). With the power saver profile active and the display set to about 150 nits, an automated script calls up a different website every 40 seconds. To check video playback, we play a loop of the short film Big Buck Bunny (H.264 encoding, 1920 x 1080 pixels). 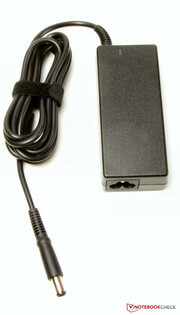 Here, the power saver profile is active, the wireless modules are turned off, and the display is set to 150 nits as well. We had to plug the Inspiron back in after 6 hours and 5 minutes. The Pavilion didn't last quite as long (4 hours 47 minutes). Dell's Inspiron 15 3542-2293 is a well-rounded notebook. The system has more than enough power for everyday tasks and can handle a few games as well. The 15.6-inch notebook does its job quietly most of the time and doesn't get hot in the process. The power consumption is also fairly low, which results in a very good battery life. The display is appropriate for the price segment, although we would have preferred a brighter and matte panel. One alternative to the Inspiron is the Aspire E1-572G, which offers better gaming performance for less money, as the Acer notebook sells for about 50 Euro ($65) less. The HP Pavilion 15-p008ng, which retails for 600 Euro (~$750), makes for an even better gaming notebook and comes with a Full-HD display as an added bonus. 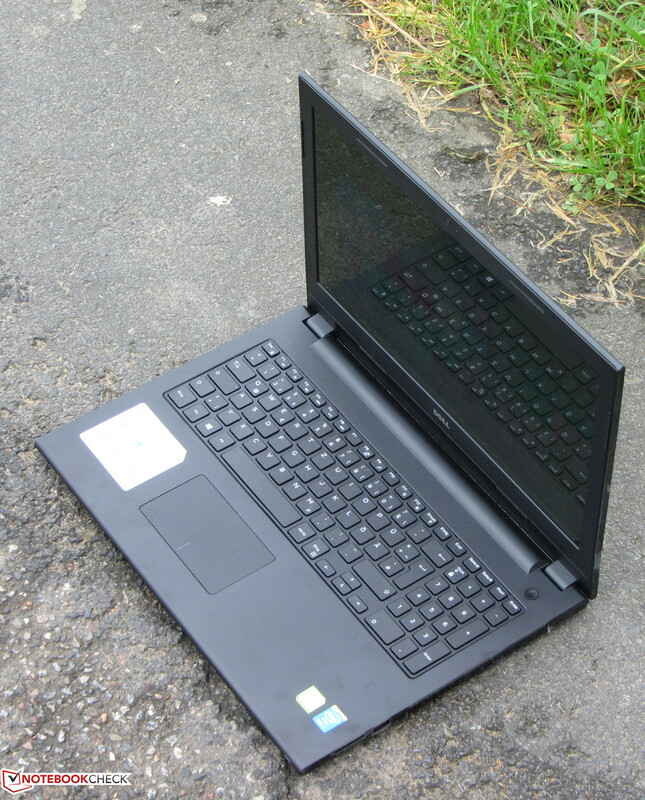 The Lenovo Ideapad Z50-75 is the bargain-basement model in our comparison. Although less powerful, the notebook can be had for 380 Euro (~$475) without a Windows OS. ... hold the display securely in any position. The Inspiron only has one RAM slot. 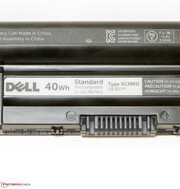 ... and offers a capacity of 40 Wh. ... and supplies 65 watts. The good battery life and the low power consumption.